Brian Dupont: Artist's Texts | An artist's writings on art. Academic simplicity would place the monochrome at a nexus of geometry and gesture, between minimal reduction and the ecstatic expression of wide fields of color, in theory allowing for a painting that removes all but the barest traces of drawing. But as with totems, the range of implementation and function is as diverse as the people who make them, and their real world existence is far messier than is often intimated. [v] Painters have been exploring and pushing the boundaries of a single plane of color since Malevich opened his “desert of pure feeling.” The point at which one color turns into another is nebulous at best; turning as much on the stuff, the paint, and how it is applied: thick or thin or mixed with what; with what energy and direction, over what ground and with what medium. One of the most obvious stratagems has been making monochromes that include more than a single hue; even Makevich’s first Constructivist icon was a black square on a white ground after all. Painters, perhaps like shamans before them, seem to bristle at imposed restraint. This brings us to Brice Marden’s new exhibition at Matthew Marks Gallery, and his return to the monochrome. Walking into the central space at 522 22nd Street the viewer is confronted by ‘Summer Square’, a large brown monochrome that stands as a seemingly stark refutation of his paintings of the last two decades. [vi] Turning to the right the multi-panel ‘Small Seasons’ cycles through subtly tuned variations on four basic colors seemingly propped up on underlying washes of paint that form a familiar footer at the bottom edge of the canvas. The show, spreading across two galleries, is intended as a statement, the argument of an exacting artist for the ground he finds himself on. In a previous exhibition I felt that he was starting to search for a unity and synthesis between his two iconic bodies of work, the monochromes and calligraphic paintings. In works like ‘Second Letter (Zen Spring)’ rectangles of color flanked his more recent curvilinear networks. Those flat sections even had nearly identical proportions to earlier sections in his multi panel paintings, such as ‘Thira.’ However upon further reflection I would now argue that his return to the monochrome has been portended for far longer. Marden is noted for being a very particular and careful painter, with so much as a dangling line seen as a momentous change[vii], so it shouldn’t be such a surprise that the groundwork for this move was laid long ago. His original glyphs turned and twisted with the energy of calligraphy[viii], but eventually their contours regulated and flattened, becoming broader and far less dynamic, but deeper vessels for color. They became ribbons rather than writing, holding one color next to another just as a single panel interacted within a larger assembly of panels in the seventies and eighties. He has been been emptying out everything but color in his paintings for longer than we might recognize; the touchstone references of his work have largely resided in Asian art and calligraphy, so much that when he exhibited a single monochrome[ix], the focus was on its basis in the colors of delicate Ru ware porcelain, and his attempt to recreate it from memory. I do not recall these nine small panels of solid color pointing to a re-engagement with the monochrome, but in retrospect it seems obvious. Marden’s tentativeness expands the exhibition, perhaps beyond what is necessary. Paintings from the Nevis Stele series show the ribbons emptying out[xv], and ‘Uphill with Center’ serves as a bridge, albeit one that feels contrived. The ground of the center panel is the same pale blue[xvi] as the Nevis Steele paintings, and the ribbons that snake across the surface are the same colors as the monochrome panels that flank it, two on a side. It is as if he felt compelled to show us that this was an organic transition between bodies of work, but the constituent parts don’t work together. The color relations aren’t enough to overcome the graphic contrast between the horizon line created by the bottom margins of the four monochrome panels and the curvilinear tracery; it reads as a juxtaposition made in the studio, not a resolved painting. The new work doesn’t need any such artificial joinery with the past. If there is anything tyrannical in contemporary art, it is the relentless demand for something new, paradoxically coupled with the expectation that the artist will maintain something close to a brand. Perhaps Marden is conscious of the strictures of his market, or perhaps his overall practice does as much to reveal who he is as do individual paintings. Either way, as an artist approaches their own winter no one should fault them for steps backwards, or those forwards that appear to miss. Marden should still be able to show us a thing or two; the paintings on Marble that he exhibited with the Ru ware monochrome harkened back to the works he made between monochrome and calligraphy, the so-called graph paper series. Underappreciated, these works, mostly on paper, pose a unique engagement with drawing and measuring the plane that would present a fascinating challenge to realize with the same sense of light in his painting. Energy and movement are preferable to a slow decline into hibernation, and there is certainly a precedent among shamans and calligraphers for expelling rather than conserving their final energies. Here’s to hoping that Marden can increase the tempo of his dance. ‘Brice Marden New Paintings and Drawings’ continues at Matthew Marks Gallery in New York through December 24th. [ii] … but perhaps inverted, with the viewer providing the movement rather than the medium supplying it. [iii] As a blank canvas. [iv] See ‘Ryman’s Tact’ in ‘Painting as Model’ by Yve-Alain Bois. [v] When handling totemic or ceremonial objects, what is often surprising is how sticky they can be. [vi] Although in an age of press releases and teases, it’s not like anyone interested is unaware of the change in his work. [vii] “(Real Marden-watchers will notice he’s even let a couple of lines dangle in space — a huge move for this ultra-circumspect artist, one that creates local concavities, triggering a sense that the whole surface is undulant. )” – Jerry Saltz. [viii] It is worth noting that this energy is still contained in his drawings, and the artist allows an abandon in ink that is missing in his large paintings. [x] See Klaus Kertess’ essay ‘Plane Image’ in ‘Brice Marden Paintings and Drawings’ (Abrams). [xi] This is where Marden distinguishes himself from Ellsworth Kelly. Kelly’s colors are typically flat and generic, and define space by their shape or relation in relief. Where Kelly’s shaped canvases project into and engage space, Marden remains committed to the single plane of the rectangle, and creates paintings where the color is embedded in the paint, rather than reflected off of it. [xii] The main space at 522 West 22nd Street is the central thrust of the show, with drawings that follow from the African series and additional ribbon paintings residing next door at 526. The show focusing on prints at 502 West 22nd is not referenced in the press release, and serves to connect earlier ideas in Marden’s practice to the current show via a different medium. [xiii] These margins again harken back to his early work, but are so wide as to be almost a caricature of the thin, revelatory strip he gleaned from Johns. [xiv] That Marden gets such dark colors to glow connects his work to European painting more than Asian art. The nine panels of ‘Eastern Moss’ pose a nice rejoinder to ‘Ru Ware’; the shift between green and brown is subtle, and though not belied by the title, the colors are reminiscent of the deep color of rough, industrial linen, a coarse relative of the material that Marden paints on. [xv] And the dates of these paintings showing us that it took a while. [xvi] Or “pale blue” as much as anyone can identify a specific color in any Marden painting. They are not so distant from the colors Marden remembered in the Ru ware painting. Out of Time (Part 2): In the Desert. As part 1 of this essay considered the metaphorical space of the desert as a model for the new condition of painting within Postmodernism, the physical space of Forever Now is equally revealing. The exhibition is on the top floor, sitting in stark contrast to Matisse’s cut outs. Compared to the lyrical journey on a pleasantly winding path that circumnavigates one of the high-water marks of modernism and pure pleasure in color and form, how is an exhibition mucking around in the creation of the grimy present supposed to stand up? The show feels as if it is being hyped to raise its profile as much as possible just on the way to the 4th floor. A large painting hangs over the main lobby like a billboard and several monumentally framed pieces are propped against the wall on either side of the entrance, like outsized carnival barker’s signs. Once inside the large space is divided into a series of branching chambers with partitions encouraging meandering and no strict path, but also no exit except back the way one came. Dead-ending against the back wall forces the viewer to rebound and wind one’s way back through the show and make new connections and consider different relations and viewpoints. The exhibition layout cancels any hierarchy and allows for slipping glimpses of how some model of the whole might lock together. Looking at the show is an exercise in exploration, of navigating terrain that is not set. Other than being painting made recently, the work has no common denominator, outside of perhaps generalities of abstraction or a certain sense of scale, although many of the works have bits of the real world peeking through. The artists share no agenda or style; they are simply trying to make paintings that reflect how they interact with and process their world. That their work shows its influences and continues a dialog with art of the past does not necessarily point to any “atemporal” influence of the net, beyond its reality as a condition of our shared world. All of the artists have started making their mature work, if not lived their entire lives since the advent of Postmodernism; the interaction between the history of images and present production is ingrained in how they approach the canvas. Amy Sillman’s abstractions provide the clearest model of how painting can make something new when the language of invention is played out, and in the process they show just how obsolete the idea of “newness” is. They are often (and incorrectly) labeled as a grab-bag mix of styles, a criticism that latches on to surface similarity rather than looking at just what Sillman creates for herself. She has found her voice in the direct handling of paint, getting colors that don’t easily go together to mix with gesture, shape and space to form a hard won picture that just barely keeps their different compositional elements in balance. They teeter on the edge of falling off the ledge, but the constant revisions within the picture are what give them their subtle vibrational energy and move the eye through the painting. The more complicated she gets the better; her simpler paintings flatten out as though with too few pictorial balls in the air there is not enough to sustain interest, either hers or the viewer’s. While there are no intimations of the figure here, it has often made appearances in her work; when it does it is more complicated in its relation to abstract elements in the picture than Guston while remaining much more autonomous than in deKooning. Just because she is working with a subject others have used, she is not beholden to them and her practice allows her raise content in subtler ways than her supposed sources. 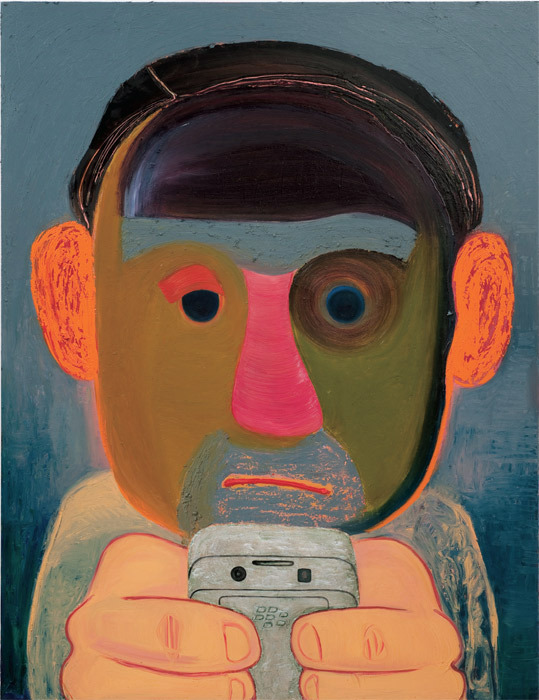 Nicole Eisenman’s large portrait heads combined confrontational scale with unassuming demeanor. They confront Picasso with a sly rejoinder born of a contemporary eye. Her large frontal slabs of color are as precisely keyed as Sillman’s, and the paint surface is as worked and rewarding of close inspection. In several of the paintings she has pasted ethnographic clippings onto the surface. Their shapes echo those built in paint, put they flicker irritatingly, causing a difficult shift in resolutions of scale as the dull grisaille of newsprint or Xerox tries to hide against oil paint, but sit on the surface pushing the space in the painting back. They continue to grate, itching the brain; the fact that I want them removed is probably why they’re there. It is also an example of just how aware a critic must be of one’s own biases. One of my favorite paintings by Eisenman, The Break up, has a similar format, but lacks additional collage. I found myself longing for its unadulterated surface, and spent time going back to see if I could get the artist’s intent rather than trying to make them fit into my own preconceptions. Her Easter Island portraits make for a dynamic conversation with Mark Grohtjahn’s mask paintings, which explode out with color and minute gesture – the mass is the same as Eisenman’s, but built as a mosaic rather than a slab; we get to see to very different artists approaching a similar idea in very different ways. In Grohtjahn any sense of a source portrait is obliterated in a flurry of paint. His works are not without their own material quirks. Impasto paint curls around stretched linen, but the paint is actually on cardboard. If you look carefully you can detect the slight deflection of the surface plane away from the wall in one of the panels. These sorts of material inconsistencies and deviations from “pure” painting run throughput the work in the show. Greenberg’s purity of medium was being discarded almost as quickly as it was becoming established dogma, and what a painting is made out of is considered only when it is blatantly foregrounded by the work, and then if it is so obvious the work usually falls flat. Rashid Johnson’s scratches in soap and wax fail for inserting a Twombly-esque distraction where none is needed; if the resonance of the materials and their importance to the artist’s cultural and ethnic experience is the central point then shouldn’t the simple act of just matter-of-factly putting them on the surface be enough? Trying to make it look like art seems more self-conscious and is ultimately unconvincing. On the opposite end of a similar spectrum Richard Aldrich’s wispy gestures are interesting as sketches writ large, an idea proposed quickly in the studio, but they do not read as full blown statements – it is here that we start to encounter the slippery slope of just how much work really is needed to make a painting. It seems as if the critical eye may slide over some paintings that seem to easily made, too strategized into being. By contrast Dianna Molzan breaks apart the components of a painting to make charming and inventive objects that inject personal idiosyncrasy into the cool ontology of the painting as object. Every aspect of her wry objects is carefully considered, and this investment results in a warmth and humor in a small scale object that stands up to an empire of large canvases. Twombly’s influence runs deep through the exhibition, like a common genetic marker. His off-handed and scrawling gesture is a common antecedent to Provisionalism and other strains of the abject in contemporary painting. Critics have not laid the blame at his doorstep, but he is the precursor for the aesthetic developments that are the most troubling to the old guard. He heralds the obsolescence of virtuosity, the divorce of the monumental work matched to a grand statement. To put it another way, when Richard Serra called Twombly the bravest person in modern art for taking on Pollock with only a pencil, the other side of this is that it was possible not only to take on Pollock with only a pencil, but to win. In winning he shifted the stakes and scope away from the tortures of labor and towards the academics of abstraction. He removed doubt from the process of making a painting that was an anathema to Guston and deKooning. It’s instructive to compare his Treatise on the Veil to Forever Now and see just how much contemporary painting falls under his influence. There are other such giants that loom over painting (Polke comes to mind) but Forever Now’s focus on abstraction is what foregrounds Twombly. Perhaps the most surprising comparison to Twombly is Julie Mehertu, who has covered her trademark precise pen line with flicks of brushed ink. It’s as if turbulent weather and atmosphere has descended to surround her previous architectural subjects. In the larger painting on view it is possible to discern her more standard pictorial language in earlier layers, giving these works the feeling that they were unsatisfactory works that were treated as salvage experiments. They also seem to come out of the small scale (and definitely less-produced) paintings in her recent solo show at Mariam Goodman, but whether they represent a new direction or merely a tangent in her practice, they stand out for how they relate to the exhibition’s curatorial conceit. Mehertu’s iconic works are steeped in the relationships of systems and the transfer of information across global networks; there is a robust thread connecting them to the digital references the concept of the atemporal suggests (and William Gibson’s writings practically demand), but Hoptman’s focus is on the recycling and reclamation of images and references rather than the mechanisms and infrastructure of that transfer. As such whatever formal turns Mehertu takes, the comparison of the exhibition is limited to surface similarities of the aesthetic qualities of the objects themselves and not to exploring the deeper implications of the interactions. Collector’s darling and critical whipping boy Oscar Murillo is presenting his paintings for the first time in New York. Given the arc and design of his career it would seem to raise expectations perhaps beyond what the paintings can support. Murillo seems aware of the possible bind, and his interest in moving his art past just being pretty pictures on the wall is on view in a pile of unstretched canvases left lying in the corner to be dragged around and rearranged by the show’s visitors. The gesture speaks to a common desire by painters, especially those working abstractly, to be taken seriously and express something beyond mere decoration. Murrilo’s answer is to allow the viewer to interact with his works as he does before they are finally stretched. There is a frission to be found in touching and moving works in a museum, however the artist’s studio is not necessarily an ideal arena for viewing art, and importing its processes into a museum trivializes his choices rather than lending them gravitas. Instead of revealing thought and process they become just an opportunity for the audience to take selfies. The gesture also feels arbitrary, as his stretched paintings on the walls are not out of place with the rest of the exhibition. The bruised surfaces and casually gestural compositions belie an elegant colorist with a keen sense for collage and editing together fragments to form a cohesive whole; his integration of the separate parts and seams are much more integrated into his overall process and the resulting paintings than Albert Oehlen’s recent exhibition with a similar focus. The youngest artist in the show, he is emblematic of the potential problems of a new, metastasized art market that limits judgment to such a narrow career arc, without allowances for growth or change. Forever Now is MoMA’s first exhibition of painting in 30 years, but beyond the imprimatur it is neither encyclopedic or revolutionary; instead it continues a line of exploration that maps trends and similarities in Postmodern painting. High Times, Hard Times: New York Painting 1967 – 1975 at the Whitney Museum explored how painting turned towards objecthood in the wake of Minimalism and the advent of Postmodernism. Cheim and Read presented Reinventing Abstraction, a less known history of the 70’s and 80’s as a source of continuing rehabilitation of abstraction in painting during a period when Neo-expressionism crested into a second wave of conceptual art; it showed painting that was being made in studios the last time MoMA put on a painting show, and illustrated just how much influence can shift and change. In the vein of the shifting landscape of criticism and fashion, one should also consider the Whitney’s Remote Veiwing (Invented Worlds in Recent Painting and Drawing), which explored contemporary painting’s relation to dense and personal networks of information. An exhibition a decade past, its links and history organize a thesis that is not dissimilar to that of Forever Now, but with a drastically different focus. The network of Remote Viewing leads to practices of labor-intensive detail, to an exhaustive search for a framework that will mesh with a personal vision. Forever Now references the contemporary Internet, where the birth and appropriation of images are midwifed by brand identities and the ease of cutting and pasting over a wi-fi connection. That so much of Forever Now seems to fall flat may point to this ease of execution; as labor is devalued across the economy, the less demand there is for works of art that grate with a material density that cannot be easily replicated by a JPEG or digital scan, but the most successful works on view maintain their material reality as paintings. This remains true throughout the medium’s history, no matter the whims of the bazaar. The essay concludes in Part 3. Conveniently coinciding with the exhibition title, entrance to the show is not timed. Which is not dissimilar from the large gallery spaces where most of this work is exhibited. A strategy well known in the design retail stores. Most of the works lock in at a large, but not overwhelming scale. Who could only get close to head-like lumps when working abstractly. Who made the abstraction of the figure the entire subject, the figure was the space of the painting, never really in it. Johnson’s inclusion is curious as he is primarily known for much stronger sculptural work, and the “paintings” included are a minor strain in his practice. These works fit with the exhibition in a way that one of his mirrored shelving reliefs do not, but that speaks more to his being included as a broader marker representing his practice; this in turn points to a possible agenda not encoded in the works themselves. Just examine the care and detail in the construction of her stretchers. The more common commercial stretcher builds would interrupt the delicate geometries she creates. And they are objects as opposed to pictures; their depth and the relation of the inside to the outside are inherent to them in a way that separates them from “Painting” proper. Much like Richard Tuttle in sculpture. Think of the references to graphitti that abound around his work and consider the confidence of his marks as someone stepping up to a wall with limited time and no room for doubt. I do not think it was necessarily a good idea to hang Mehertu’s paintings adjacent to Rashid Johnson’s works. The superficial similarities, albeit played out in contradictory materials (ink separated by isolating layers of acrylic vs. the earthy weight of soap and wax) are a facile comparison. It would have been just as obvious to hang Jacob Kassay’s silver mirrors across from Johnson, if he had been included. Then again, maybe not. One can also look at the recent trend of museum-quality shows in commercial (mega)galleries and then think that maybe David Zwirner has a much cannier strategy mapped out (remember the giant killer robots mentioned in the notes of Part 1? They’re coming in Part 3). It is nearly impossible to circumvent such criticism, but perhaps painters would be better off reading this than importing a Columbian chocolate factory to 19th Street for a month. It may be a litmus test for how you feel about the show and contemporary painting in general if you consider that to be a good thing or bad thing. It is startling to read contemporary criticism of the show and to see the nascent fragmentation of painting as a medium and similar concerns that are the same after so much time. Perhaps there is an origin for Provisionalism in Vernacular abstraction, or at least a historical precedent. There is always room for curatorial kvetching: I would’ve cut Bradley and Josh Smith and replaced them with R.H. Quaytman and Joanne Greenbaum. I don’t know anyone who pays attention to the art world who is not dismayed with its increasing stratification, with concentration of wealth and influence in the hands of a tiny few. It’s a turn of events that has seen Art increasingly treated like an investment asset, just another high-end luxury good or status symbol. Edward Winkleman posted an essay on his blog that puts the onus on artists to take the lead in saving art and John Powers answered from an artist’s point of view, countering that instead artists need better data to make the proper decisions. While everyone involved has been motivated by wanting art to thrive and not see it’s aesthetic and social value choked off by the market, suggestions as to real solutions are more difficult to come by. My feeling is that the art world, and more specifically the art market, essentially reflects the capitalist economy we are all enmeshed in. Yet art is set at an acute angle to the culture as a whole; as an object produced according to a singular vision its reflection is distorted for the extremity of that position compared to other cultural products. It is held to a higher standard not only for its legacy within culture, but for offering greater hope for change by providing an undiluted voice, and it is immeasurably darkened if it instead saccharinely manipulates those expectations. We might know that these expectations are messily built on fictions, but they don’t make any of us love art any less. What art allows us to express is something that no one who loves it wants to see transformed into another dumb commodity, but that also doesn’t mean we can excise art from the rest of the global economy and set it aside in its own crystal lined utopia. The problems ascribed to the art market are at their core problems of a certain trends of capital metastizing around art: increased prices leading to increased and watered down production, top galleries conglomerating and poaching talent to enclose the market in a near monopoly, speculators flipping art works at a high profit and to the detriment of artists’ careers, focused elitism alienating art from mainstream society; all easily map onto other markets, other bubbles. Any discussion of change must somehow account for this reality. Powers likened this position to “cosmic background radiation” and I must say that I agree; the cosmic background radiation permeates the universe in a way that the current incarnation of capitalism has spread throughout most aspects of the global economy. If you look deep enough it is always there. Likewise, art can be separated from other markets only to a superficial degree: real-estate, fuel, and other commodities represent real costs to anyone operating a business. So if dealers must follow the laws of the jungle in order to maintain their business, why is the calculus any different for artists? They are running a small business, and if they are to make their practice sustainable (if not sustaining) then falling on their economic sword in the name of art is not necessarily attractive. This is where Power’s comparison of artists to the young drug dealers chronicled in Freakanomics is the most apt. As the lowest rung in the art world’s economic ladder, artists economic power is diffused over the broadest population, and if there’s always another dealer willing to pander in the name of a dollar there are ten artists dying to have their work shown, eager just to get the work out of the studio and maybe start to recoup the cost of an expensive studio rent and maybe start to pay off student loans. If an entry-level drug dealer’s best option is to quit, not play the game, and go work in fast food, where does that leave artists?Altering the market for drugs in Chicago required a host of changes, many coming from the top down and involving interventions and incentives unavailable to most artists. Art dealers have a more concentrated economic stake, and are better poised to recoup the benefits of a change to the system. Dealers of course operate at different levels, and I suspect that everyone at the market’s pinnacle is quite happy with the situation as it stands. That leaves change to emerge from the bottom up, and out of the middle. It’s all well and good to ask artists to lead, but actual change will require the organization of the entire community; not just artists, but also dealers, critics, and collectors. The art world has evolved to an imperfect symbiosis with its own market, and perhaps the most relevant question is if it is even possible for it to survive independently? The influx of money is at the root of the symptoms; it has pushed the tiny world of contemporary art out of its confines where everyone knew everyone else and is driving the current “grow or go” phenomena that magnifies the distortion of the largest galleries and secondary market. But this growth has also allowed space (admittedly often small) for other voices to become viable and alternative narratives to gain purchase. When Winkleman notes that dealers in the middle are exhausted and finding it hard to climb above a certain level the thing that stands out to me is just how much climbing is built into the system for everyone. As our culture and politics turn more nakedly Darwinian, and the art world with it, I don’t want to see the realities of the market acknowledged because I agree with someone like Stefan Simchowitz, but because suffering its collapse would drastically reduce the diversity of voices. A certain amount of churn is desirable to avoid stasis and ossification; the pressure to “keep climbing” helps birth new ideas, or rediscover old ones, but also raises the distinct possibility that change may not take a form that we envision. I think that absent a profound shock to the system it is more likely that the art market continues to progress along its current path with the general economy rather than retreats to a form from the recent past that is more comfortable. However this is not to say that those of us who love art should not be engaged in arguing for art to move according to our vision (unified or not), but we must know what we are asking for. To make work that is less “flippable”, less of a commodity, flies in the face of art’s recent history, where anything can be sold. It is no different a request to ask artists to somehow reject the market as it is for a dealer to ask for something smaller that also happens to be a pretty color. Either option comes at a cost to the artist and their work, and the consequences of such decisions should be properly weighed. If we accept that everyone is climbing I would argue that artists are already leading. Granted, I think most artists move instinctively towards gallery representation and the popular notion of a career, but where that path has not been open they can still be found working to expand their voice in other ways; engaging in the debate waged with things by also curating, writing, and creating their own exhibition spaces. Whether these projects become a core component of their practice or something to be left aside as they gain traction in the art world, they remain as the base of the art world that is committed to art for its unique value of expression and as a form of knowledge, not as an expensive bauble. Perhaps it’s time for gallerists, critics, and curators who want things to change to dig in their heels and start working with artists with whom they share this commitment. For the purposes of this essay I am leaving out any specific aesthetic debate; changing the economic structure of the art market is a separate issue from arguing how to be sure that ‘good’ work is what is being supported. We all like different art, but are working within the same economic system. Arguing about aesthetics is a second front, and we all know how multi-front wars tend to go. And I realize that I may need to use that term loosely in describing art. Again, looking at the more popular consideration of how art is made rather than how insiders might know it to be made. I’m thinking here of cultural productions with dedicated industries like film and TV that necessarily are collaborations from inception. Art (and art by “art stars”) has tended towards this style of production and is one of symptoms under discussion, but what makes “art” truly the art of our time is that it can still be produced from start to finish by a single person in a single room. References to it as “late stage” capitalism seem more like wish-castings on the part of certain critics more than anything else. …or someone else’s vision of what that means. Although, honestly, just getting the work out of the studio and seen is really motivation enough for most of us. In the form of both government funded programs and education, and the more direct intervention of law enforcement. Starting roughly when America became (or declared itself) the center of contemporary art in the 1950’s. You can chart other milestones like the Scull auction or the rise of Soho and then Chelsea, or the explosion of art fairs down the long winding road to our current hell. Surely the analogy to certain giant reptiles of the Cretaceous period has been made by someone by now. Mass-extinction events tend to do that. It is worth remembering that for all of the horror that greeted the return of painting and its market in the early Eighties, history has largely corrected itself. Gallerists have probably noticed these efforts in their in-boxes. Some of my favorite programs in New York are in artist run spaces: Auxilary Projects, Centotto, Minus Space, Pierogi, and Regina Rex have all been started by artists; the number would multiply exponentially once one starts to consider other spaces, and in as much as artists are always concerned with space, forming their own exhibits in their own spaces has an august history.